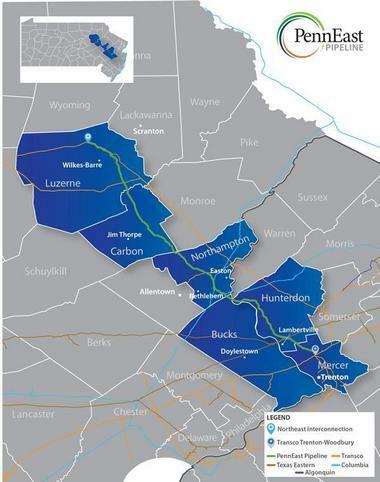 PennEast is a high-volume, high-pressure pipeline designed to transport natural gas from the fracking fields of northern PA through the Lehigh Valley and on to markets in other areas [perhaps overseas]. As with any major construction project, impacts on natural resources can be significant and can effect health and lives of people and animals. Current plans call for a 36″ diameter transmission pipeline; pressures in these lines generally run from 200–1200 psi — about 100 times the pressure in a service line to a home. PennEast has not yet disclosed where compressor stations will be needed to maintain the pressure at desired levels. Gas in these lines is normally not odorized, which means you can’t even smell a leak. While large leaks would be detected and repaired promptly, low-volume leaks in the transmission process are not unusual. The immediate threat is the construction of the pipeline. They are proposing a 100′ right of way which means significant disruption of habitat and exposure to invasive species, ‘edge effects’ in forested land, habitat disruption for wildlife — all of which last for many years. Wetlands, waterways, and aquifers are at high risk, because they are vulnerable to changes in soil hydrology — and because pipeline companies choose such areas to avoid paying higher costs for easements in developed areas. The proposed route traverses many such areas and crosses under both the Lehigh River and the Delaware River. And, of course, the pipeline is designed to transport natural gas from the Marcellus Shale area, meaning it encourages even more fracking and destruction of these areas. [Read The Real Cost of Fracking for a good picture of how these processes affect people, pets, and livestock.] Also remember that scientists at Cornell University have shown that the total climate impact of natural gas from fracking, well leakage, and transmission is worse than coal! If you want to get involved in the permitting process, check out Mark Gallagher’s presentation on Pipelines and their Environmental and Regulatory Conflicts.